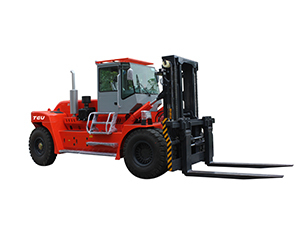 Internal combustion counterbalance forklift is a kind of powered industrial truck used for lifting and transporting materials. This forklift truck adopts diesel oil, gasoline, liquefied petroleum gas or natural gas engine as motive power. 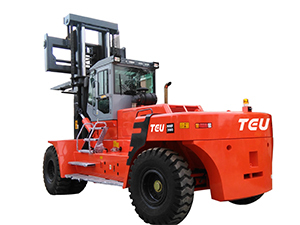 TEU mainly provides diesel forklift and gasoline forklift. 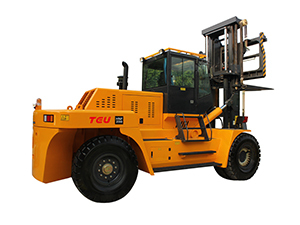 Considering the exhaust gas emission and noise problem, the internal combustion counterbalance forklift is usually used in outdoors, workshops or other places with not special requirements for exhaust gas emission and noise. The forklift truck can accomplish long-time continuous operation due to easy fuel refreshment. It is also suitable for working under hostile environment such as rainy days. The internal combustion counterbalance forklift with large size has good stability. It is suitable for heavy load. The loading capacity of this forklift truck is form 1.5 to 10 T and the working channel width ranges from 3.5 m to 5.0 m.
With unlimited use time, it is generally used in outdoors. Gasoline engine of internal combustion counterbalance forklift has small size, light weight, low noise, small vibration as well as low price. The working principle of this forklift truck is similar to the seesaw, so we shall firstly find out the loading center of gravity, which is half as long as the tray. The load center of the internal combustion counterbalance forklift is usually 500 mm or 600 mm. It is recommended to change the machine oil every 50 hours during the running-in period. For bad working conditions, the oil should be changed when it becomes black or loses its viscosity. 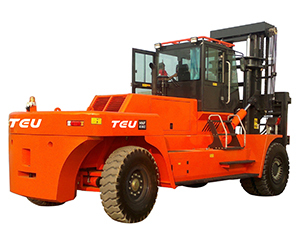 Anhui TEU Forklift Co., Ltd. is a professional manufacturer and supplier of forklift trucks in China. 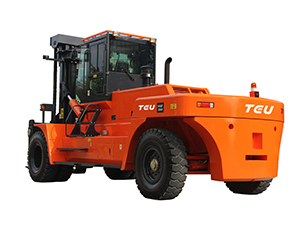 Our main products include diesel forklift, gasoline forklift, electric counterbalance forklift and internal combustion counterbalance forklift. Our products are used in the fields of logistics and transport, port and pier as well as storage and hauling. Till now, we have established exclusive selling agencies in Australia, Russia, the United Kingdom and Northern Ireland, Korea and Iran. Our internal combustion counterbalance forklift trucks have been sold to Southeast Asia, South America, Africa and Europe.